Hair clippers, how to best do the job? World’s 1st smart epilator. Guides for less pressure to remove even more hair. with 12 extras incl. 3 exfoliation brushes. Not sure which models suits you best? SensoSmart™ guides for less pressure to remove even more hair. Braun’s new generation of epilators include SensoSmart™ technology, putting expert guidance in your hands. An intelligent sensor guides your epilation, ensuring the right amount of pressure is applied to remove even more hair in one stroke. A red light signals that you are pushing too hard, and prompts you to adjust your handling for more efficient epilation. The world's fastest and most precise epilator ever, the Braun Silk-epil 9 Wet&Dry epilator removes even the shortest hairs that wax cannot catch for up to 4 weeks long lasting salon-smooth skin. Attach the new deep exfoliation brush and reduce ingrown hair with an exfoliation performance that is 6x more effective than a manual scrub alone. The gentle exfoliation brush visibly refines your skin for an irresistibly smooth and silky feeling. The shaving head is great for removing hair even in the most sensitive zones. The latest addition to the family: The Deep Massage pad for significantly better blood circulation and visibly improved skin appearance. MicroGrip tweezer technology with 40 tweezers, it removes hair as small as a grain of sand for perfect smoothness for up to four weeks. High performance bristles with unique triangular shape, and sonic technology. Gently refines your skin for an irresistibly smooth and silky feeling. Perfect for the décolleté or for sensitive skin. Deeper massage effect than a standard body brush, helps improve skin appearance and blood circulation. Pivoting head adapts to every contour. For efficient epilation, even in difficult areas like the knee and underarm. Braun Silk-épil 9 has a 40% wider head* removing more hair in one stroke for a faster epilation. Enjoy long-lasting salon smooth skin for up to 4 weeks. Catches 4x shorter hair than wax. 0,5 mm, to be precise. The new Braun Silk-épil 9 MicroGrip Tweezer Technology brings you a new level of epilation precision. Featuring wider, longer and deeper tweezers the Braun Silk-épil 9 removes with precision even the shortest hairs that wax cannot catch (down to 0.5 mm). So you will not have to wait anymore for your body hair to grow long enough for waxing. Take control. No more in-between days, no more hassle. Up to 4 weeks of long-lasting, salon smooth skin. 100% waterproof for comfortable use Wet&Dry. You can easily clean the Silk-épil 9 epilator under running water and comfortably use it in the bath or shower. Epilate in warm water for a virtually painless experience with regular use. Use it in the bath or under the shower for extra comfort. The warmth of the water releases endorphins – the body’s natural pain reliever. It reduces any slight discomfort and skin irritation. When used regularly, epilation is virtually painless. Helps to improve skin appearance. Massages your skin noticeably deeper than a standard body brush. The effect is improved blood circulation helps to visibly improve the skin appearance. Helps to avoid ingrown hairs. Gently yet effective, the deep exfoliation brush features high performance bristles with unique triangular shape. Regular use helps to avoid hair getting stuck under the skin surface and visibly improves skin appearance. Thanks to their unique triangular shape, the new high performance bristles deliver even better exfoliation. The unique combination of different filament lengths and the cup design helps your favorite cosmetic (scrub, gel, etc.) stay in place. Can be comfortably used in a bath or shower for an extra soothing experience. The high density brush with 10.000 fine bristles gently removes dead skin cells and stimulates skin regeneration. For an irresistibly smooth and silky feeling you can’t stop touching. The shaver head turns the Braun Silk-epil 9 Wet&Dry epilator into a fully functional shaver. With the trimmer cap it lets you trim hair where preferred. Great for removing hair even in the most sensitive zones, without red bumps or irritation. The Smartlight reveals even the finest hairs and supports extra thorough hair removal. with 40 tweezers, it removes hair as small as a grain of sand for perfect smoothness. Speed 1 for extra gentle epilation, Speed 2 for an extra efficient epilation. 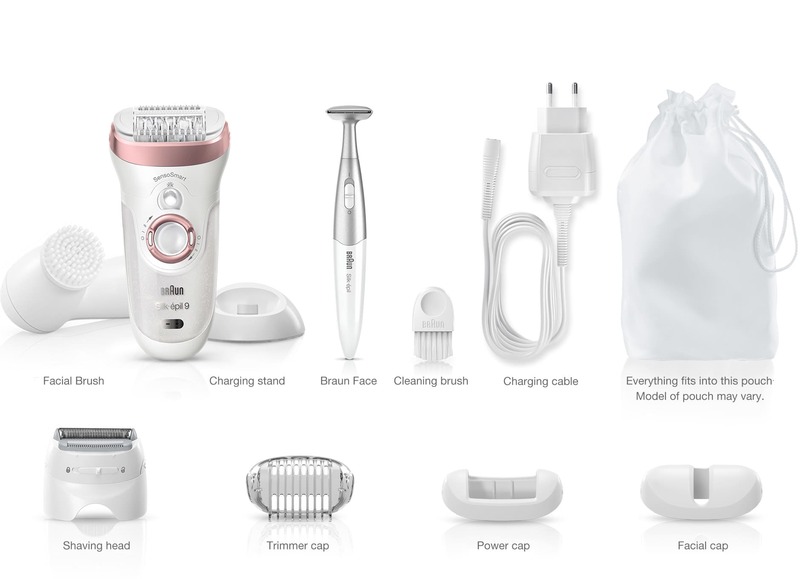 Discover the world's first facial epilator & cleansing brush system.